Electricity costs can make up a large portion of the overall budget for your home, business or non-profit. With a solar panel system, you’ll be generating free power over your system’s 25-30 year life cycle. Even if you don’t produce all of the energy you consume, your utility bills still will be much smaller. Either way, you’ll be saving a lot of money. Solar panels aren’t an expense. They’re an investment that pays handsome returns often rivaling those of more traditional investments such as stocks or bonds. 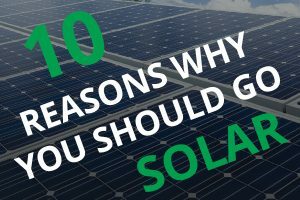 Substantial savings as well as the potential in some areas to generate revenue result in ROIs of 20% or more, making solar one of the best ways to invest your dollars. Because energy prices are so unpredictable, they make managing your budget very difficult, especially for businesses or homeowners whose cash flow fluctuates from month to month. By making these costs more predictable, solar power systems have the added benefit of improving a home or business owner’s expense management capabilities. Early studies have found that buildings and homes equipped with clean energy systems have higher property values, selling twice as fast and at a premium of 3-4% over similar homes in the same neighborhood. Appraisers are increasingly taking solar installation into consideration as they value the home at the time of a sale. As appraisers and consumers become more educated, homes or commercial properties equipped with solar panel systems will be more in demand and may even get even a higher premium. Solar energy is a pathway to achieving U.S. energy independence from foreign oil. Because we consume far more oil than we produce (25% vs. 3%), the U.S. is not only dependent on foreign sources for our oil, but we’re also transferring billions of dollars from our economy to oil producing countries, many of which have links to funding global terrorism. Studies predict the clean energy sector will generate between 3-5 million “green collar” jobs over the next decade. Because these jobs tend to be higher paying and generally are not “outsource-able”, they represent a significant contributor to the U.S. economy. Solar is a great way to reduce your carbon footprint. Buildings are responsible for close to 35% of all carbon emissions in the U.S. and going solar can decrease that number significantly. A typical residential solar panel system will eliminate 3-4 tons of carbon emissions each year—roughly the equivalent of planting over 100 trees every year. Sustainability and corporate social responsibility not only tie to an organization’s culture and values, they also produce bottom line results. Increasingly, consumers and communities are recognizing and rewarding businesses that choose to operate responsibly. Businesses are finding that “green” credentials are a powerful driver of consumer purchasing decisions, creating goodwill and improved business results. Just like consumers, employees have a demonstrated appreciation for their employers’ commitment to operating responsibility. Employees share in the success and contributions of their organizations. When they feel good about where they work, they are more engaged, have higher levels of morale and lower turn-over rates. 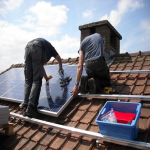 FAQ: IS SOLAR A GOOD OPTION FOR THE NORTHERN UNITED STATES? Yes, solar power is a good option for northern states. While the intensity of the sun is less than it is in the South or Southwest, it is sufficient to produce significant amounts of electricity — enough to power an entire home, depending on the size of the PV system.